Ruth Arthurs was two when she came to the hospital in Accra with her mum. Ruth was born with a cleft palate and lip. As a happy baby the effect on her was to make feeding difficult. As she started learning to speak, she would have difficulty forming her sounds. As she got older she and her family would have become more and more outcast from their society. Ruth was lucky, cleft repair surgery costing around £200 has given her back her smile and her chances of a happy, normal life. 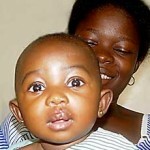 Clefts can be repaired and people can lead a normal life afterwards. The ReSurge Africa units have helped break the taboos associated by many with cleft in Ghana by initiating cleft surgery on ever increasing numbers with help and assistance from the Charity’s Scottish founders as well as international cleft organisations, such as “Smiletrain”.